Plattsburgh natives Ed and John Trombley will be keeping the coveted Mayor’s Cup trophy right in Plattsburgh. 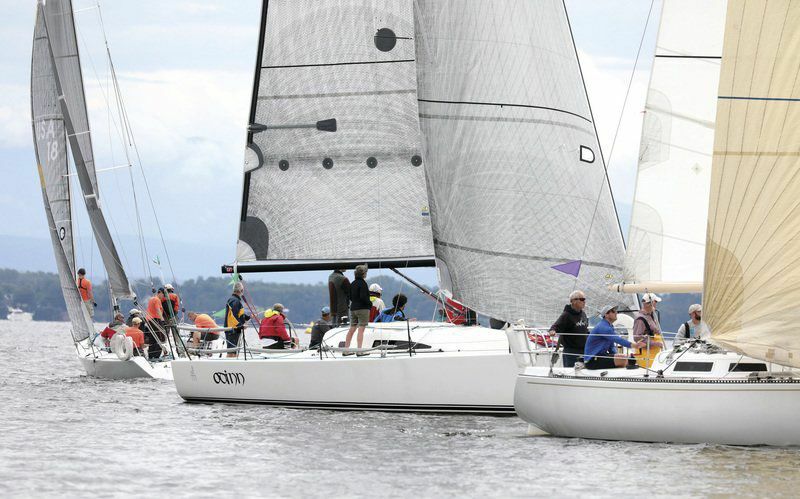 The duo helped lead the crew of Odinn to victory with a corrected time of 1 hour, 51 minutes and 36 seconds Saturday at the 40th annual Mayor’s Cup Regatta on Lake Champlain. The regatta was delayed about an hour due to minuscule amounts of wind, but once Odinn was able to hit the water, John Trombley said the conditions were not ideal but manageable enough for the crew to excel. “It was very tricky to find which way to go,” he said. “The wind was light, but it was also shifting all over the place. Ed Trombley noted the conditions were not great to sail in by any means but acknowledged that the experience of Odinn helped propel the crew to victory. “John and I have been sailing forever. If you are sailing with another talented person, it’s very easy, whether they’re your brother or not,” Ed Trombley said with a chuckle. The victory is the brothers’ second Mayor’s Cup win as a tandem. “This is the most well-known regatta anywhere around the area,” Ed Trombley said. “It’s a big deal for local people, and it’s a big deal for us to win it. Jean Pierre Turgeon, of Saint-Bernard-de-Lacolle, Quebec, finished second in the racing division, clocking in at 1:57:17, while Williston Vermont’s John O’Rourke rounded out the top three with a time of 2 hours, 14 minutes and 3 seconds. Jocelyn Duteau and the crew of The Avengers from Lacolle, Quebec, placed first in the cruising division, finishing at 1:22:49 to secure the Rotary Cup, awarded by the Sunrise Rotary Club since 1997. Montreal’s Miro Balcar and the crew of Endo-X (1:26:21) and Glens Falls’ Larry Hinkey and the crew of Full Fraes (1:46:49) finished second and third, respectively. In the multihull division, Dan Kisel, of Balston Spa, propelled Way 2 Many to a first-place finish, completing the race in 1:10:51. Hot Tamale, led by Chazy Landing’s Tom Sweet, took second, crossing the finish line in 1:12:58. Chazy’s Jim Sweet and the crew of Zap ranked third in the multihull with a time of 1:13:56. Regatta coordinator Dr. Kjell Dahlen said that designing the course was problematic because wind gusts came from the south and not the west as expected, prompting him to adjust the course three times before boats started to race. Dahlen said he kept a close eye on the forecast and knew lightning was a possibility during race time but noted he was glad the regatta didn’t have to be delayed any longer than it was or possibly postponed.